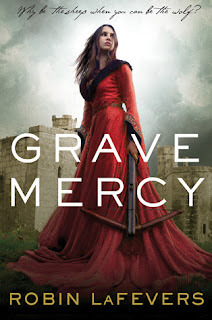 This week, my swoon is from Grave Mercy by Robin LaFevers! As he looks into my eyes, his smile fades and his eyes grow dark with emotion. Slowly, he leans toward me. His lips are soft and warm as they touch mine. His mouth moves urgently, as if he is trying to experience every nuance and curve of my lips. The utter rightness of this fills me, for it feels I have waited all my life for just this moment. His mouth opens slightly, and he shifts the angle of his kiss, nudging my mouth to do the same, and I am lost in a whole new world of sensation. His mouth is soft compared to the strong, callused hands that grip my waist. I love this series! What better time to reread it, with the fourth book publishing in February. I can't wait! I have this book on my Kindle I think (I have so many that I'm not even sure at this point xD) but oh this was swoony. I love it! I loved this one. I need to get busy and finish the rest of the series. Looks like I need to try the series!